I just got a new account at a delightful little store in Larimer Square in Denver. Violet is owned by the lovely Stacy who keeps the store stocked with really beautiful, color rich pieces. The store itself, with it's violet walls feels somehow airy and cosy at the same time. The clothing is fashionable, quite covetable and the best part is that it is all affordable. I mean how often do you fall in love with a dress at an upscale boutique only to find that it is $200? Stacy has amazing things that pretty much hover around or below the $100 mark. Yeah! She has great jewelry too in both gold and silver tones and come mid-May when my collection arrives, she will have some edgy copper. Above are some of the pieces she ordered from me. 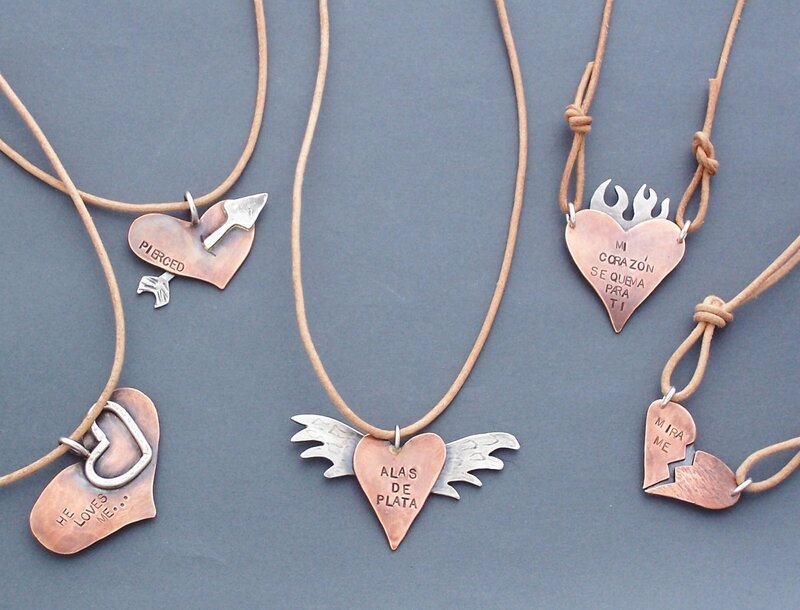 These hearts are petite versions of some of the pieces in the Hearts and Wings and Flames Oh My! collection. They will retail for $102.00. Currently "Pierced" is the only one of the petite hearts on the website but soon all 5 will be available.